Bangalore: Former president A.P.J. Abdul Kalam Monday awarded six distinguished scientists with the Infosys Prize 2011, instituted by the Infosys Science Foundation, a not-for-profit trust set up by India's IT bellwether. The winners are Kanpur Genetic Algorithms Laboratory director Kalyanmoy Deb in engineering and computer science, Centre for Cellular and Molecular Biology scientist Imran Siddiqi in life sciences, Stanford University professor Kannan Soundararajan in mathematical sciences and Indian Institute of Science (IISc) physics professor Sriram Ramaswamy in physical sciences. University of Chicago professor Raghuram G. Rajan and Centre for Policy Research chief executive Pratap Bhanu Mehta were awarded in Social Sciences (Economics and Political Science and International Relations respectively). In recognition of their outstanding achievements and contributions in scientific field and social arena, Kalam honoured each of the winners with a prize money of Rs.50 lakh ($100,000), a 22-karat gold medallion and a citation expounding the Infosys laureate's work. The noted scientists were selected by the Foundation trustees and the eminent jury panels comprising Nobel laureate Amartya Sen for Social Sciences, Shrinivas Kulkarni (physical sciences), Pradeep K. Khosla (engineering and computer science), S.R. Varadhan (mathematical sciences) and Inder Verma (life sciences). The Foundation is funded by a corpus of Rs.100 crore (Rs.10 billion), contributed by the trustees and an annual grant from the global software major. The Infosys Prize is amongst the highest in terms of money given for any award in India. Trust president and the company's former director T.V. Mohandas Pai also announced on the occasion that the Foundation would introduce a prize for Humanities from this year (2012) covering philosophy, history, archaeology, linguistics and literary studies. 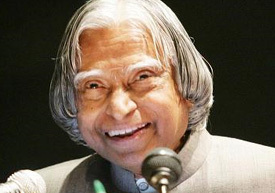 Congratulating the winners, Kalam said the awards celebrate the success of researchers, their research work and their teachers from school to university. "We live in a knowledge-based era and a nation's strength is truly judged by the quality of collective knowledge. It is important to recognise and encourage productive academic pursuits. Initiatives like Infosys Prize will boost the confidence of researchers in physical, biological and social sciences and related fields," he said after presenting the awards. Lauding the winners for world-class contributions in their respective areas of specialisation, Infosys chairman emeritus N.R. Narayana Murthy said the prestigious prize for the third year was a commitment to encourage the distinguished scientists at a time when it could make a greater difference to their career and attract young minds to research. "The winners' effort and dedication to science, discovery and development will inspire educationists and researchers in India and the world over to strive harder to excel in science and technology and attain global recognition," he said on the occasion. In his address on the occasion, Pai said scientific research was the bedrock of social and technological progress of any economy and the awards were not only intended to recognise outstanding scientists, but also to motivate the research community and persuade bright young people to adopt careers in research. "There is a significant depth of scientific talent in the country and the objective of the Infosys Prize is to identify and encourage such outstanding talent," Pai added.